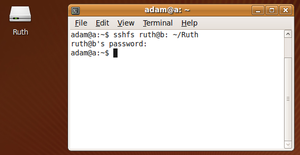 ^ sysutils/sshfs-fuse: sshfs-fuse-2.4p1 – mount remote directories over ssh. OpenBSD ports. 2013-06-15 [2015-02-10]. ^ Canonical Ltd. SSHFS - Community Ubuntu Documentation. May 2009 [2009-06-05]. ^ Szeredi, Miklos. SSHFS FAQ: What options does sshfs support?. November 2008 [2009-06-05]. （原始内容存档于2009-04-18）.